Wouldn’t you love a faster internet connection? Do you think 40 Gigabits might just about cover all your browsing and video calling needs? If the idea makes your head spin, you may never have heard of Sigbritt Löthberg, whose blisteringly fast internet connection earned her fame in Sweden for having the fastest internet in the entire world. How do you get a connection like that, you might be wondering? Well, it helps if your son happens to be famous Swedish computer technician Peter Löthberg, who has been a pioneer in internet advancements since the 1970s. Löthberg intended his mother’s ridiculously fast internet connection to serve as an example of a modulation technique that allows data to be transferred between two routers with no intermediary transponders. In an interview at the time, Löthberg said that he wanted to show that there are other methods aside from “old fashioned” copper wires, and he stressed the opportunities that fibre cables had to offer internet connections. 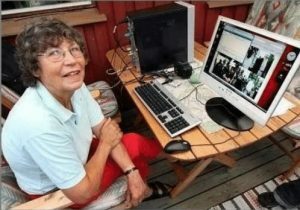 Mrs Löthberg, a sprightly 75 when her devastatingly fast internet connection was installed in 2007, is relatively new to the internet, but has the ability to download a high definition DVD in a mere two seconds. Her connection is recognised by Guiness World Records as the fastest internet connection in the world.